(Release Date: July 29, 2014)  Arriving near the end of a late-'70s/early-'80s slasher-palooza that was put into overdrive following the success of John Carpenter's seminal "Halloween"—the most profitable indie of its time—"Curtains" didn't create much of a stir in 1983, yet has built a passionate cult following in the years since. There are several reasons why, all of them valid. In lieu of a straightforward plot pitting dopey teens against a psychopath picking them off one at a time, "Curtains" has an entirely adult cast and a layered narrative that embraces its eccentricities. The central goal is not to merely slice through the ensemble—though this does happen, as well—but to explore the seedier cutthroat politics of moviemaking and the desperation that often comes when reality does not match up to one's aspirations. Beyond that, the film features a truly disconcerting killer cloaked in an old hag's mask, and a round-up of outstanding horror setpieces, two in particular saturated with an eerie mood and theatrical ingenuity. Smarmy film director Jonathan Stryker (John Vernon) is preparing his new project, titled "Audra," and has promised veteran actress Samantha Sherwood (Samantha Eggar) the juicy title role. When she takes her method preparation to the next level, convincing doctors that she is crazy as a ploy to getting admitted into a mental hospital, Stryker cruelly leaves her there and sends out invitations to six young hopefuls for a weekend casting call at his secluded mansion. With a wintry snowfall fast approaching, the actresses convene at his woodsy abode. Well, five of them do; the sixth, the role-playing Amanda Teuther (Deborah Burgess), is stabbed to death before she has time to leave her own house. As the women vie for the part in their own tactical ways, they are accosted by a disguised lunatic out to cut the competition. Adding to the sordid mystery, Samantha makes a surprise reappearance, having escaped from the institution and determined to convince Stryker she is the right person—the only person—to play Audra. Like other genre pics such as 1980's "Prom Night" and 1981's "My Bloody Valentine" that were filmed around the same time, "Curtains" was made under a Canadian Tax Shelter which helped to minimize up-front costs in exchange for employing a crew largely made up of citizens from U.S.'s neighbor up north. The production was a bumpy one, to say the least, with at least one major casting change and a one-year hiatus during filming that led to rewrites and reshoots. Director Richard Ciupka, unsatisfied with the final edit, replaced his opening name credit with the onscreen director's own, Jonathan Stryker. While it is probably immensely disappointing for a filmmaker to see his original vision not come to fruition, Ciupka should have taken a closer look at the finished film and realized that what was there was still pretty darn good. Is it a little rough around the edges? Could a fuller, more developed director's cut have led to an even better finished product? Yes and yes. Sadly, there have been reports that the sole remaining film elements of said uncut version, running over fifteen minutes longer, were outrageously ordered destroyed in 2009. What a shame. There is something to be said, however, for the fevered mystique that "Curtains" has acquired in the decades since its release. The picture doesn't always play by conventional slasher rules and its more surrealistic aspects render it all the more fascinatingly esoteric. A curtain swishes open and closed to signal sporadic scene transitions. A toddler-sized doll, its arms outstretched and a frown on its face, is used as an emblem of doom, in one haunting moment showing up during a rainstorm on a winding mountain road. For fans who know "Curtains" well—and for those who remember very little—there is often one particular sequence that none of the above forget. Professional ice skater Christie Burns (Lesleh Donaldson), who is hoping this unorthodox casting weekend will help her to make the leap into acting, heads out for an early-morning skate on a nearby frozen pond. As she swoops and glides to the sounds of Burton Cummings' "You Saved My Soul" on her boombox, she is alarmed when the cassette tape is abruptly stopped by someone while her back is turned. Going over to check it out, Christie doesn't realize that the masked hag killer is in her midst, skating toward her as a razor-sharp sickle is revealed from behind his or her back. That this scene is set in the bright light of day, further illuminated by the whiteness of the snow surrounding them, injects the dire circumstance all the more with a shuddersome menace. "Have you ever wanted something so badly you would do anything for it?" asks stand-up comic Patti O'Connor (Lynne Griffin) during one of her acts. It may be the setup to a punchline, but it also rings true for Patti and all of the young women hoping the role of Audra could be their big chance to be taken seriously. In "Curtains," Richard Ciupka and screenwriter Robert Guza Jr. provide novel misdirection as director of photography Robert Paynter casts a purposefully off-balance theatricality to his imagery, finding beauty in terror and vice versa. The climactic chase between the murderer and Tara DeMillo (Sandee Currie) through a backstage prop shed, the darkness of the space lit by a large "applause" sign in the background, cooks up crafty tension and a quirky visual spark. In their search for recognition—the applause, so to speak—these ladies are about to pay an irrevocably large price. The closer one peers into the weird and macabre pleasures of "Curtains," the more its technical mastery and subtextual implications reveal themselves. "Curtains" and 149 other great films are featured in my book, "The Fright File: 150 Films to See Before Halloween," which is available on Amazon.com, Amazon Kindle and Barnes & Noble. Oh. My. God. For its high-definition debut, "Curtains" has been "lovingly re-mastered in 2K resolution from original vault materials virtually untouched for over 30 years," and for anyone who has only seen the picture in its crummy past incarnationsas an overly dark, oft-indecipherable VHS transfer from Vestron Video and a just-as-bad duping on a low-rent 4-film DVD collection from Echo Bridge Home Entertainmentthis 1080p rendering will be an absolute revelation. I have seen the film several times over the years (or at least struggled to see it through the muck), and each time it was very clear that the movie, with all of its atmospheric set design and wintry location shooting, could be gorgeous if ever someone took the time to find the original elements and give it a proper facelift. Now that Synapse Films has done just that, the act of rewatching "Curtains" is like seeing it for the first time. Over and over, I was quite literally jolted by what I sawnot just from two particularly stirring jump scares, but also from the eye-opening details which this new sterling print reveals. From the mascara-streaked tear running down Christie's face in the bedroom scene to the cut on her chin (a result of a nasty spill Lesleh Donaldson took during the ice-skating sequence), from the snowy nighttime hot tub scenes to one utterly surprising particular shot of a lonesome ski lift that I had never been able to make out before, the film goes above and beyond one's loftiest expectations. The print is very clean with a lush layer of natural grain resting upon the image. Yes, there are a couple fleeting moments of warping on the sides of the frame, but this is inherent to the vault materials and unavoidable. Meanwhile, the occasional white speck will likely go unnoticed unless you're searching for them. The additional fine details, texture and clarity are out of this world in comparison to all previous versions since it played in select theaters in 1983. Every last line and wrinkle on the killer's old hag mask jumps off the screen, while even the actors benefit from the dramatic uptick in resolution, revealing nuances to their performances that I had never caught before. Finally, can we talk about the climactic prop shed sequence? UTTERLY, ASTOUNDINGLY, FRIGHTENINGLY RAPTUROUS! The level of production value and aesthetic craftsmanship in this setpiece is staggering (the artificial cityscapes, the deep shadows, the hanging mannequins and clowns, the flashing "applause" sign, the corridor of sheets), turning itand the ice-skating scene that fans know and loveinto two of the top-tier moments in 1980s slasher-flick history. On the aural front, Synapse generously offers two choices, and you can't lose with either of them: the 2.0 Original Mono, and a fresh 5.1 DTS-HD Master Audio which opens up the soundscape in exciting ways. Considering that the film is, indeed, over 30 years old, the uncompressed audio is an immersive treat for the ears. While dialogue is generally front-heavy, the back speakers come alive in the music and sound effects (the score by composer Paul Zaza is memorably layered and eloquent). Full-bodied and free of pops, cracks and hisses, the audio tracks are without fault. 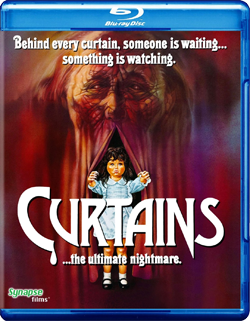 Relative to how borderline-unwatchable its home video offerings have been up until now, "Curtains" is the Blu-ray of the year! Synapse Films continues to set the bar for all high-def distributors in terms of how much loving care they bring to every facet of their releases, with founder Don May, Jr. going above and beyond the call of duty in giving each title the reverence that all cinematic art deserves. The company's perfectionism paid off big time with superb past Blu-ray efforts such as "Street Trash" and the astounding "Demons" and "Demons 2" steelbooks, and now they've done it again with "Curtains." For too many years this underrated gem has been relegated to video store dustbins as just another half-forgotten relic of the early '80s saddled with a piss-poor transfer, but now, on this lovely disc, devoted fans and new viewers alike will be able to see just why this creepy, stylish, one-of-a-kind horror-thriller is worth (re)discovering and holding in high regard. Packed with quality special features on top of an already awe-inspiring A/V presentation, Synapse Films' "Curtains" Blu-ray should be an essential addition to everyone's collection. A MUST-OWN.